In the last quarter of the 19th century some masters believed that training with the foil had become overly academic, much to the detriment of those called to the dueling ground. A new approach thus developed to rectify this problem. 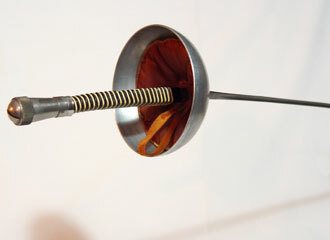 Many aspects of rapier and early small-sword fencing of the 17th century were revived and infused into this new system. The guard position was more upright with the arm and blade held more extended placing the blade in a more horizontal plane. The dueling sword had now adopted a larger cup-shaped guard although still mounted with a triangular cross-section blade. The dueling sword (Épée) taught is the traditional French school.